Oh, wait, I forgot I'm blogging and not singing Adele's latest song, Hello. I thought I last blogged mid November. Appears that I blogged last in mid October! Well, a lot has been happening and not much on knitting. First of all, I had a deadline with my work as a programmer. The deadline was the week of Thanksgiving, but we were not done (far from done). I was working 10-14 hours each day from the week before Thanksgiving to the week after Thanksgiving. The Wednesday after Thanksgiving (December 2), I felt a muscle ache on my left arm that suddenly occurred while I was driving home (8:30 p.m.). You know you read about left arm pains = heart attacks... so I took my blood pressure... nothing abnormal - maybe about 10 points over my usual for both numbers. Took a shower - finding that my breathing is a little labored... but still feeling ok. Went to bed and woke up at 4 am suddenly, feeling like a pile of books is on my chest, especially on the left side where my heart is! Woke up, took an aspirin, a Zantac for gas (nope, not Xanax!). Took my BP again.. still not too bad. And I had a UTI so I was on this antibiotics. The PA said my blood sugar is extremely high, but when I got home, I poke my finger for a reading and it was normal, so I don't know what that was about! Anyway, what I was feeling could be side effects from the antibiotics or I'm having a heart attack! First thing first... I signed in to my work at 4:30 am. Made sure everyone can continue with their work if I don't make it. 7 am - I crawled into bed with my husband and asked if I should go to the ER. He said I sounded fine. I got up, packed my toiletries bag in case I need to be checked into the hospital. Packed my knitting. 8 am - I said goodbye to my husband as if I may not see him again (OK - he felt guilty not driving me in), but he did show up 2 hours later at the hospital. I showed up at the ER desk and asked if I should go to the Urgent Care of the ER.. she couldn't give me any medical advice due to legal reasons, of course. But I knew that if I went to Urgent Care and mentioned the words, "chest pains", I will be sent to the ER... so I took a short cut and checked myself in at the ER. They did the enzymes test, EKG (or ECG now, as it's called, because K for the German spelling for Cardio, (Kardio? )...they couldn't get a Nuclear Stress test scheduled that day so I had to spend the night. I was discharged by 5 pm on Friday. My heart is normal - no blockages. Heart is pumping properly and can get to a certain heart rate. My problem is I have to do a better job at handling stress. A follow up with my doc ended up with a breathing exercise, which is the most challenging thing to do. How can I sit down and just relax and breathe? I also don't know how to take deep breaths with my stomach sitting up so I have to lie down.. Maybe when I'm an expert at it, I can do stomach breathing while knitting? 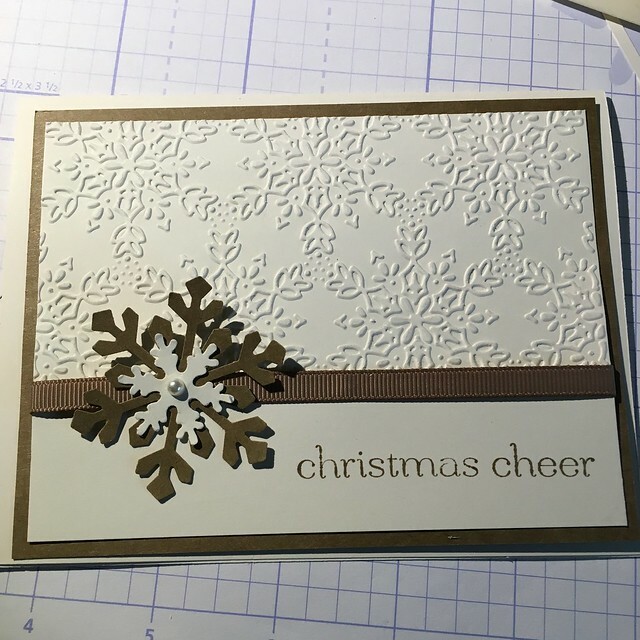 Also, I picked up an old hobby, making hand stamped greeting cards. My home office is now filled with paper and tools. I spent hours on Pinterest getting ideas. 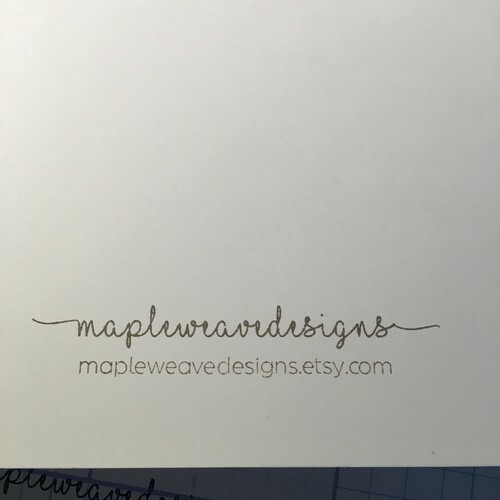 I even ordered a stamp for my cards as I was ready to open my etsy shop! 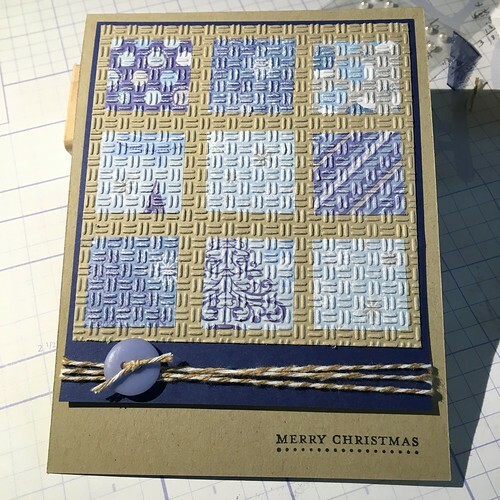 Here are some cards I have made. 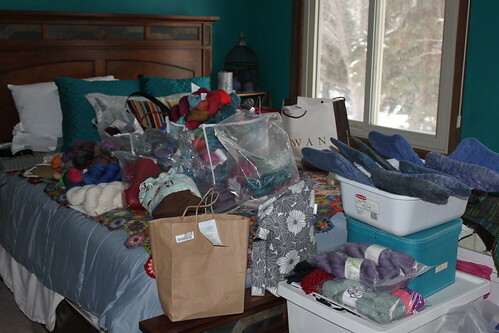 So, another excuse for not knitting, not blogging. 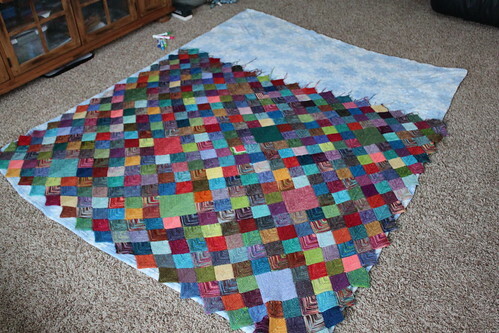 When I do knit, I've been trying to meet my goal for leveling off my blanket, and I did it yesterday! I now have 560 squares and I'm 2/3 done with it. Give me 2 more years and it will be done! I started this in June, 2010. 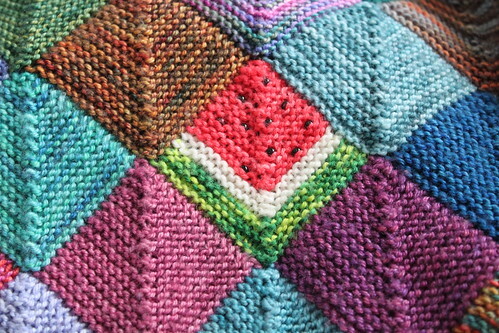 Did I tell you about the watermelon square I knitted last year? 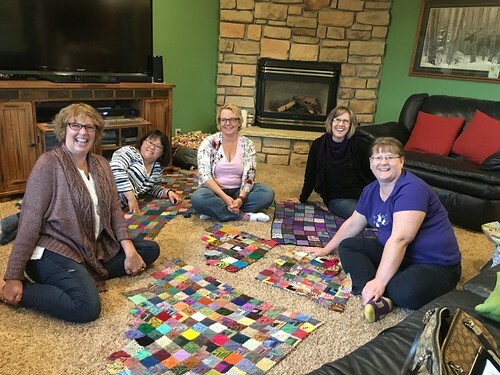 Last month, I had my Tuesday Night knit night's girls over and they brought their blankets to work on. Here is our group photo. I did not knit any gifts this year as you can understand.. I do want to knit a headband for my friend, Sharon. I already have the yarn - just didn't have time to knit. 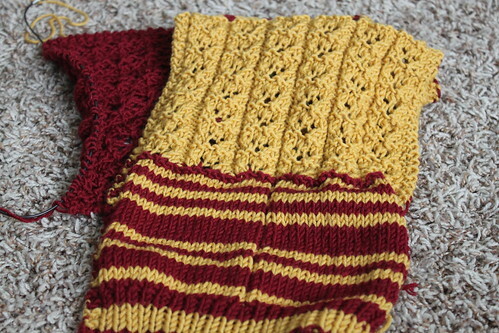 But I did start on an infinity cowl for my daughter, who will be starting at the University of Minnesota next month.. She transferred from University of Wisconsin - Madison. She is majoring in Food Science. So the colors for the U or M is Gold and Maroon. I'm not done with it, but I'm more than 1/2 way there. 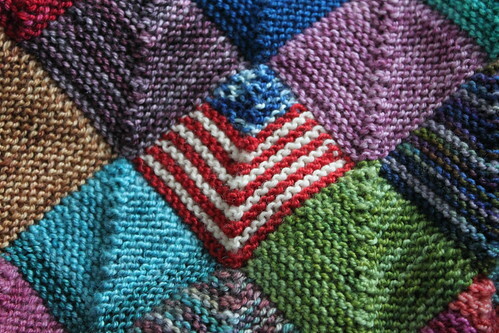 This is a pattern by Irishgirlieknits - Ring of Kerry. 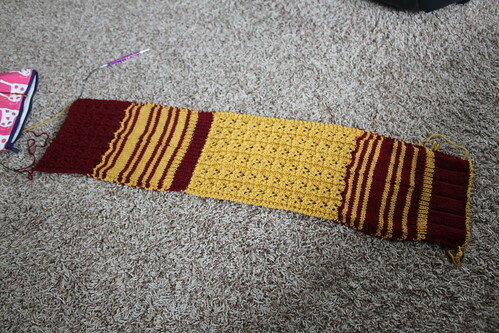 When it's done, it should look like this, but really, I wasn't quite following the pattern! 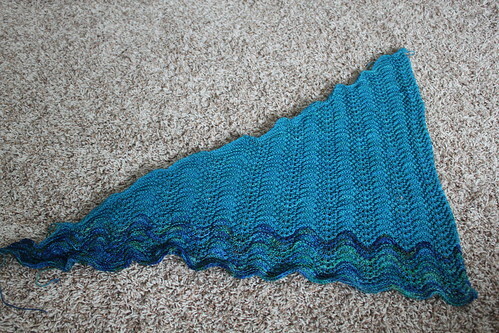 This was the shawl that inspired me to buy 2 sets of yarn for. 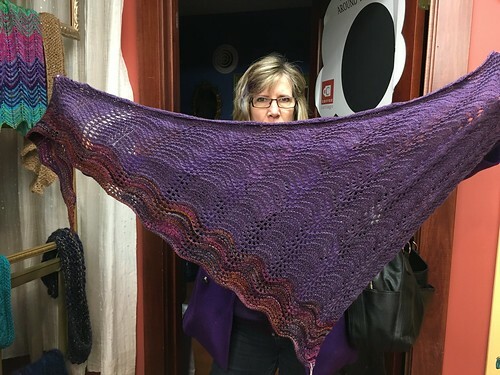 My friend, PurpleKathy posed with the shawl. I haven't blocked mine, but I did get it done at the hospital! 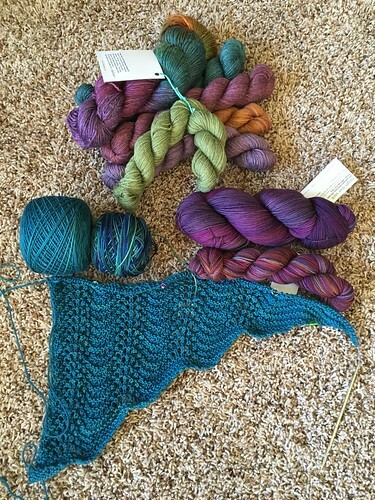 I'm itching to start a shawl, but don't know which yet. 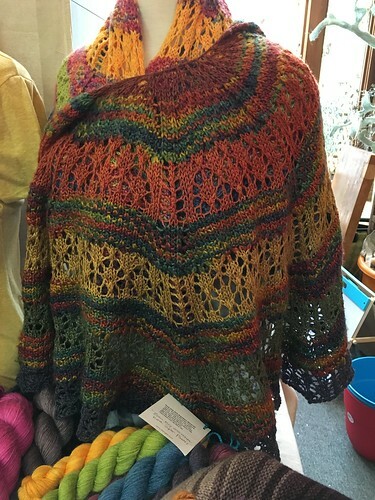 The colorful set above was purchased to knit this colorful shawl. 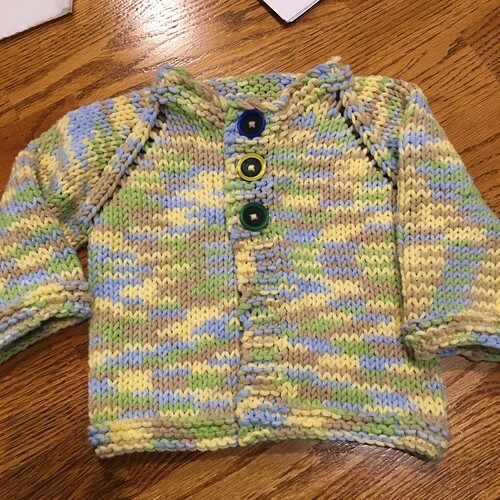 It's a kit from a Three Irish Girls Trunk Show. 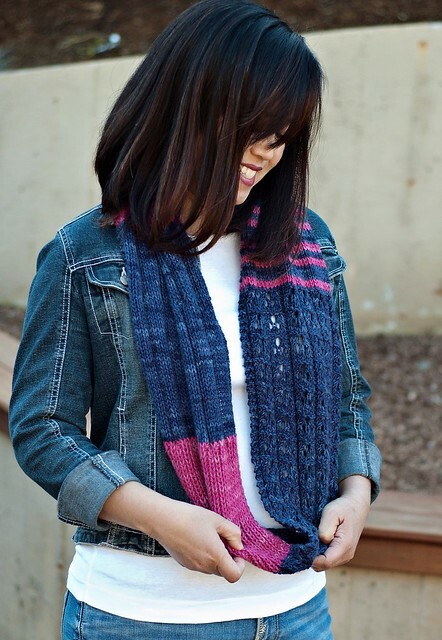 The featured shawl is not the same kit as the one I bought. I finished my first sweater! But the sleeves were too long for Beckett. I may ask if I can fix them. 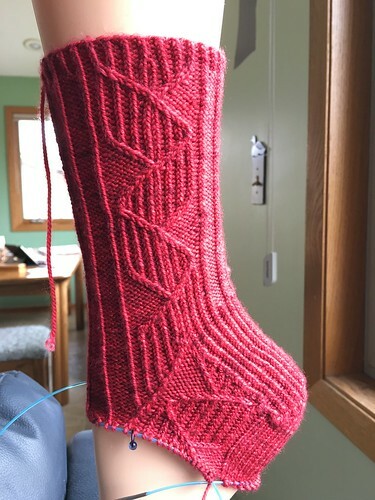 I participated in the SKA Mystery Sock in November, but just didn't have the time or energy to complete even the first sock! 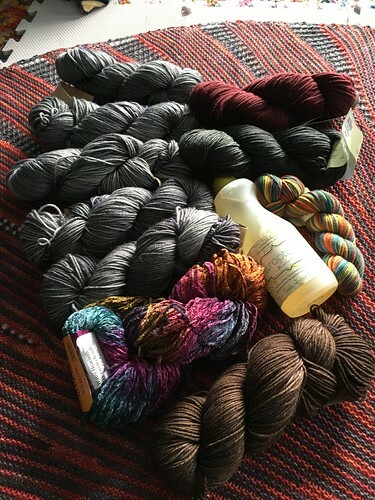 And yes, the only shop I went to on Black Friday was at my local yarn shop where I DID NOT draw the 75% off the entire purchase poker chip. I drew the 25% chip (which was the lowest denomination if you got there before 10 am). I was brave enough to get yarn for a sweater! GASP! AND - my birthday is tomorrow. Tell me what you want to read more about on my blog and your name will be entered into a drawing for some yarny goodies. OR, SPOILER ALERT if you have not seen Star Wars The Force Awakens - close this window now!!!!! I will draw a name on New Year's Day.